Well, March madness of the work-not-basketball variety strikes again, as it does every year, but here's Part 2 of my Gerritsen Beach posts, showing the quilts and the library. 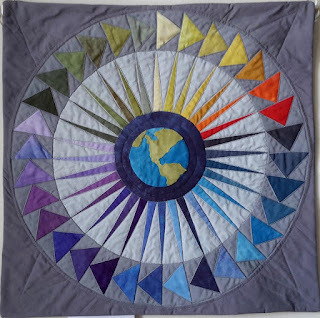 This was an exhibit of small quilts made by members of the Brooklyn Quilters Guild for an annual "Challenge" in which a theme is given, which participants are allowed to interpret entirely as they choose. The only requirements are that the quilt must be 20"x20" and have a pocket sewn to the back for a dowel to go through for display. The 2016 theme was "Trip Around the World", with Barb Christ's "Flying by Night", shown above, selected for the publicity shot that was on social media, like the Facebook notice that caught the eye of Shari, our instigator du jour. Ms. Christ's piece was an homage to migratory birds and efforts to increase awareness of the problems that bright lights cause these travellers. Absolutely stunning, I wanted to go the minute I saw this, and it ended up being a very fun and interesting way to spend an icy afternoon! The Guild had a reception that day, with light refreshments, and some of the quilters there to talk about their works. It was not the formal event I was somehow expecting, I was somehow thinking there would be a gallery room and a lectern, but the quilts were hung up above the bookshelves in the main room, and the talks were done standing in a group and chatting as we walked around and looked. It was really neat seeing the different ways people approached the challenge. Ms. Christ's hand-dyed triangular pieces turn out to be a quilt pattern callled "Flying Geese", so any quilter would look at it and recognize the avian motif; I don't know anything about quilting but even without that inside knowledge, I was still struck by sense of movement. I also learned about "paper piecing", which was the technique she used, cutting templates out of paper and basting your fabric to those, which then guide your stitches very precisely. It turns out that "Trip Around the World" is also a quilt pattern, and that led to some interesting variations. The pattern is one of squares sewn together with colors carefully arranged to form a strong diamond shape. Some of the quilters riffed on that; Margaret Marcy Emerson's "Across the Universe" moved the pattern eye-catchingly off-center. She was inspired by photos from the Hubble Space Telescope, and this is her own "venture into the galaxy". Beautiful! Eileen Anderson's "So Be!" also used the pattern, but with pastel colors, flamingos, and a border of travel charms, all in honor of one of her favorite destinations, South Beach in Miami Beach, Florida. A couple of the quilters honored our borough of Brooklyn, which can offer the sense of going around the world without leaving home (like when I go for one of my long walks, starting out hearing Caribbean accents in my neighborhood of Flatbush and finishing on the boardwalk in Brighton Beach, aka, "Little Odessa", I love that!). Lynn S. Hill's "Brooklyn Is the World" used the Trip Around the World pattern again, with squares representing the different cultures of the borough, and a background of fabric with a nautical chart pattern, which I thought was very clever. Brooklyn appears again in this picture of three other favorites of mine. The one thing we didn't love about the exhibit was the height at which the quilts were hung, way up above the shelves - there were such amazing details in some of these little quilts that it would've been nice to be able to see them from less of a distance. The reason was very sensible, though - this is a public display and people might be tempted to touch, or worse, take. I could see the temptation - I was absolutely in love with these three. The one on the right uses a similar approach to the one above, only with the pattern used for the background; this is Christine Janove's "Without Leaving Brooklyn", I wish I'd gotten a better picture, I think the Brooklyn fabric is a culinary print because she refers to all the different delicious cuisines you can try here. She used nautical chart and map prints for the pieced background, and in a nice finishing touch that you may be able to see if you click on the picture (ok, and if you have a good monitor, my work monitor isn't great and I can hardly see the detail at all), she quilted a globe with latitude and longitude lines over that background. Really nice. Closer view of the other 2 in that set. The one on the right, Doris T. Douglas's "A Trip Around Various Habitats", is the challenge name pattern again, done with metallic thread and such beautiful fabric (actually looks a little bit like a sparkly throw pillow I have that I like very much). And then on the left is the first quilt I'm showing you where the quilter went off in an entirely different direction, sewing a stunning image of water rolling up on sand. I absolutely loved how Michele Cucker used lace for the foam for her "Shore Lines". Now I am not a stealing type person but boy, I looked at this one and thought "Yeah, smart to have them out of reach". So so so so pretty. Kathy Clarke's "Trip Around the World" - instead of the Trip Around the World pattern, she chose to use another traditional motif, a "star block", in a really fun way! From the flyer: "My trip around the world includes the whole universe, with the stars rotating around a rocket ship in orbit". So cute! Mary Rumsey Hawley's "Travel Memories" - turns out you can scan your vintage postcards, flip the images, and print them on iron-on transfer paper. I think she said there's an app for that! The last of the challenge quilts I'm going to share is Madi Appell's "Wherever I Roam, There's No Place Like Home". She's travelled all over the world but she says her favorite part is seeing the Manhattan skyline again and knowing she's home safe. And the way she sees the skyline is just glorious. There were more, but that's enough for one post! If you're interested in seeing the exhibit, it runs through April 3rd. Full details at the Guild website. The guild members also showed us a few other quilts that they'd made for the library. Some of the guild members meet there on Friday afternoons to work on their quilts together, it's a beautiful and welcoming library and they made these to say "Thank you". One of the guild members had her notebook out, and I found her hand-drawn notes on graph paper to be interesting and even beautiful in their own right. Love that this was sponsored by the Ezra Jack Keats Foundation - I just learned about the life of this remarkable children's book author and illustrator this winter when I read "A Poem For Peter", a wonderful picture book/poem/biography by Andrea Davis Pinkney, who is actually a co-worker of mine at Scholastic and just such an amazing person. I actually got to go to her book launch this winter, and of course I got a copy - I do that when I go to book launches - and I loved it. Nice NPR story about it here. Anyways, with that on my bookshelf and fresh in my memory it was just really nice to see that his namesake foundation had helped pay for the gleeful art I was enjoying so much. The library building itself is beautiful! Shari remembered going to a little library in a storefront when she was growing up in this neighborhood - they've come a long way! And then I went to Sheepshead Bay and had crab legs for dinner. What more could a person ask of a freezing cold and blowy afternoon? I love quilts and these are lovely. The work alone blows me away and then the imagination, the colors, the delicate stitching. I loved in the novel THE INVENTION OF WINGS, that slaves used quilts to communicate pathways to freedom and the underground railroad. Art in the face of death or misery. My grandmother made each of her grandchildren a quilt and I treasure mine. Thanks for this. They really were, and the variety was astounding, so many different visions on the same theme. I should look up that book, maybe at my library now that I have a card again! Lovely that you have a quilt from your grandmother. I have a nice old quilt that was actually made for (I think) my great grandmother, in York, PA - a group of her friends each made and signed a block and then stitched it all together. I just kept in in the linen closet for a long time after it was given to me, then one very cold night I decided that quilts were meant to delight people's eyes and keep them warm - so I started using it on those rare cold snap nights when my apartment's well-maintained but old radiators just can't quite fight off the cold. Our upstate New York public library sometimes has quilt exhibitions,but nothing like this. I have family in Marine Park. Too bad I won't be visiting for quite a while. A hand-made quilt will keep you warmer than any store-bought blanket. I think it's the hands. You didn't happen to have an aunt named Wednesday, did you?